Digital Rights Management (DRM) is a digital license system that allows content creators and distributors to control who can use their content, and how they can use it. To protect content with DRM, each video is encrypted with media keys during the encoding stage. The digital license can then be authenticated to allow or disallow playback from the end users computer via the video player. 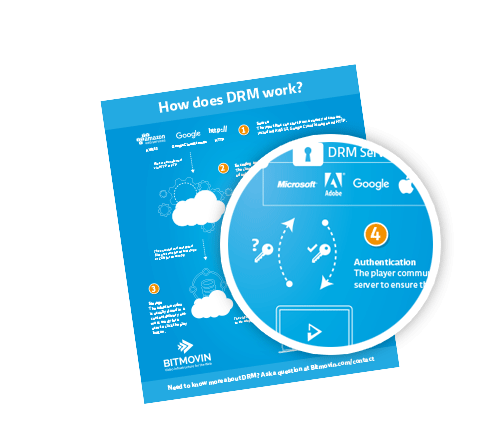 What is DRM and how does DRM work? The State of the Web 2018: DRM Whitepaper is a comprehensive explanation of Digital Rights Management giving you everything you need to build your DRM or Multi-DRM system, encoding inputs through to HTML5 playback. Our API has fully tested integrations with all major DRM providers, like Irdeto, ExpressPlay, BuyDRM, EZDRM and Conax. Customers use the Bitmovin Video APIs to build flexible and customizable workflows for DRM-protected video with maximum device and browser coverage. Building a DRM solution Documentation for integrating Multi-DRM solutions into your adaptive video workflow. Browser and Device DRM Support Browsers and platforms that are reached by the most common DRM technologies. Adobe PrimeTime Adobe PrimeTime is the successor of Adobe Access and was officially launched on the National Association of Broadcasters (NAB) show in 2013. Google Widevine Widevine is a Hollywood grade DRM technology initially developed by Widevine Technologies and acquired by Google in 2010. Microsoft PlayReady Microsoft released PlayReady in 2008 and it’s one of major DRM systems out in the market with broad device support and sophisticated features.